One caveat: right now, I do not have a working solution. The following is a description of what I’m working through to solve this problem – and any advice would be greatly appreciated! My game idea didn’t involve technology as much as a concept of what I wanted the players to “feel” when they played it – the sort of fully immersive game where you feel like you are “in” the game world, and you have physical reactions (heart pounding, adrenaline spiking) like you would if it was real life. This meant that the game would have to involve the use of the space around you, in order to psychologically simulate the idea of fear and accomplishment. The example I came up with was a simple “ghost hunter” game – very similar in concept to the way Ghostbusters trapped ghosts – crossed with the real-life apprehension you have playing Laser tag or paintball. One player would start a game (similar to starting a game in a multiplayer shooter like Quake or Unreal Tournament). This would create a series of enemies located somewhere in 3D space around them, which they’d have to avoid, as well as capture and trap. Other players would then be able to “join” their game (via peer-to-peer networking), in which case they’d see the enemies in the same exact physical 3D locations, but adjusted relative to the 3D location of their phones. 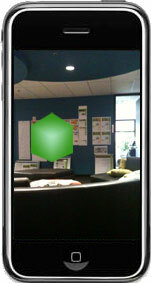 The following image shows how two iPhones (or iPod Touches) would view an object (the green cube). 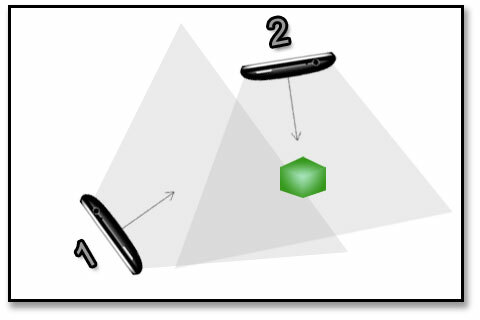 In order to implement this game, I need to be able to locate a device in 3D space, and display an object relative to the device itself. Let’s start with the easy part. Latitude and longitude are given through the CLLocationManager (for the device’s location), and CLLocation:getDistanceFrom: to measure the distance between the current location and the location of any other objects. 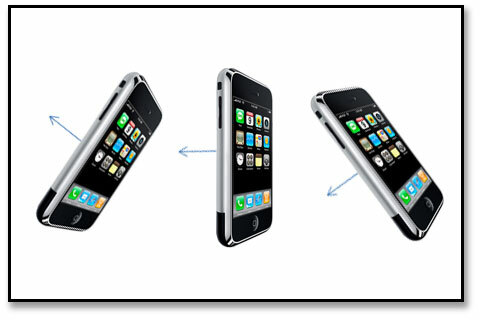 We also need to know where the device is pointed (there is a different view when you’re facing forward versus facing backward). The magnetometer will give us the compass direction, which we can use to adjust where other objects are in 3D space. We still have two more things we need to know where we are in 3D space. One is the vertical viewing angle (the viewing area will be different if we’re pointed at the ceiling, versus pointed at the floor). I was planning on using the accelerometer to help me figure out this angle based on default values (either perfectly horizontal (parallel to the floor) or perpendicular to the floor). 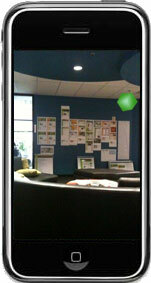 The one final variable that I need (and the one I don’t think I can get) is the height of the iPhone from the floor. 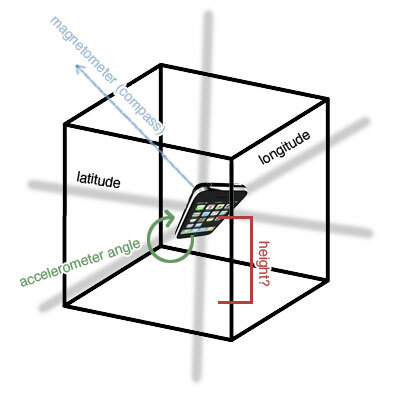 From what I’ve seen, other iPhone augmented reality applications ignore this, and assume a fixed distance from the floor (for argument’s sake, let’s arbitrarily call it 1 meter). The problem with this is that I wouldn’t be able to have ghosts hide up by the ceiling or down on the floor – everything would effectively be in the same plane view, which means simple rotating 360 degrees would show the full game area (and would greatly decrease the difficulty, challenge, and intensity of the game). As much as I don’t like posting problems without solutions, this is a problem that I’ve been playing with for the past few months and I didn’t want to sit on it any longer. If you have any suggestions for what I should do, please post them in the comments! Hey Jeffrey, how about let people set a height of him/role, and may be you can divide by 2 to get it?